IVDD experiences in dogs can vary significantly. Intervertebral Disc Disease is caused either by the degeneration of discs between the vertebrae due to aging, or by trauma to these discs (caused by an accident/exercise/trauma). Long-bodied dogs are most at risk of suffering from this problem. You can learn all about the varying causes and symptoms of IVDD, plus the selection of treatment options available, on my Intervertebral Disc Disease in Dogs page. It’s a must-read for owners of older dogs, especially those with Dachshunds, Basset Hounds, Corgis and similar breeds. On this page I’m going to tell you about my daughter’s dachshund Knox, and his experience (and ongoing battle) with IVDD. June and Henry are dachshunds owned by Lisa Luckenbach, who developed the WiggleLess Back Brace to help dogs with IVDD after seeing the problems this disease caused her precious doxies. I hope our combined experiences will give you some personal insights into how to recognize, and deal with, intervertebral disc disease in dogs. Knox is now five years old, and his first experience with IVDD happened over two years ago, before he had his third birthday. My daughter bought him from a back-yard breeder (although she knew better) because she felt so sorry for him (THAT I understand!). Apart from a bout of pneumonia shortly after she brought him home (due to a respiratory illness that hadn’t been treated) he was a healthy happy puppy, and young adult dog. Then one day he wasn’t. Knox was playing with his doxie sister, Daphne, when he suddenly started yelping and crying. My daughter didn’t know what he’d done to hurt himself but he was clearly in pain. He didn’t want to play anymore, barely wanted to move around, didn’t want to eat (unheard of for this little dog! ), he was breathing really fast and his tummy was distended and rigid. She called her veterinarian and we took Knox straight to the emergency clinic. After an exam and X-rays the vet told her that Knox was experiencing symptoms of IVDD and prescribed muscle-relaxers, pain-killers and anti-inflammatory medications. Because it was his first episode, and he was so young, surgery wasn’t recommended at this point. Our veterinarian emphasized that IF Knox started to show signs of muscle weakness in his back legs that we needed to bring him back immediately because once that happens there’s an approximately 24 hour window in which to perform surgery and prevent potential paralysis. At this point we were told that because he was so young Knox’s IVDD was most likely hereditary. We were also told that he could be lucky, make a full recovery and never have another problem…. or he could go on to suffer recurring episodes and have chronic issues. Sadly, Knox was not one of the lucky ones. Although he seemed to make a full recovery from this first episode, six months later when playing in bed with his momma, he ‘tweaked’ his back again. He didn’t seem to be in nearly as much pain as the first time, just moved cautiously, so there was no immediate rush for the veterinary clinic. BUT, a few hours later little Knox suddenly started to walk as if he was drunk, his back legs weren’t doing what they were supposed to! Panic stations. My daughter called our veterinarian, who recommended that he go immediately to the surgery center. She scooped Knox up, called me, and we all raced there. After a brief exam which showed that Knox still had pain sensation in his back legs (a good sign), and a look at his original X-rays, the veterinary surgeon laid out our options. Knox could go back on the medications, and he may make a full recovery, but if the inflammation got worse instead of better, he could end up paralyzed. OR, he could have emergency surgery to repair the damage. This option had a better chance of giving him a full recovery, but obviously wasn’t without risk. After lots of tears, my daughter and her husband decided on the surgical option and Knox was whisked away to get prepped. Those were some of the longest hours of our lives, waiting to find out if he made it through the surgery and then to see if his legs still worked. He did, and they did 🙂 Yay, what a huge relief! The surgeon recommended that once Knox was fully recovered (that means six months of being symptom free after the initial recovery from surgery) that he have laser ablation to remove calcifications on other vertebrae that had the potential to cause future problems. Fast-forward six months and Knox is doing well, my daughter is getting ready to schedule the laser surgery and…. bad luck strikes again. Knox is startled by his sister Daphne while they’re playing and he tweaks his back, again! Yep, another episode of IVDD, this time it’s possible that the problem vertebrae are in his neck, an area where the laser surgery is virtually untested. He’s currently on a full round of medications (anti-inflammatory Rimadyl, muscle-relaxers and pain-killers) and has been for a couple of months. He needs regular blood tests to make sure the Rimadyl isn’t causing liver problems (thankfully all good so far). He’s also wearing his WiggleLess brace to help stabilize his spine and prevent further damage… we all know how wiggly these little dogs are! In the past week or so he’s improved a lot and finally the meds seem to be working. He will need another six weeks of being symptom free before we can discuss the surgical options that will hopefully reduce his chances of suffering recurring and chronic ivdd experiences. Fingers crossed for our little hot dog boy! In the summer of 2015 Knox was stable enough to have a Laser Disc Ablation procedure done on his vertebrae to reduce the chances of him suffering any more episodes of IVDD. The procedure takes place under a general anesthetic and uses lasers to liquify the material in the discs and trigger scar tissue which then prevents the discs from being able to bulge or rupture/herniate. Current studies show the success rate to be 96.6% (ie only 3.4% of dogs went on to have another episode of intervertebral disc disease). Almost two years on, Knox is symptom free and a happy, active boy. We hope that he will stay that way long term. From Lisa (the owner of Henry & June): I am so thrilled to be writing for seniortailwaggers.com! 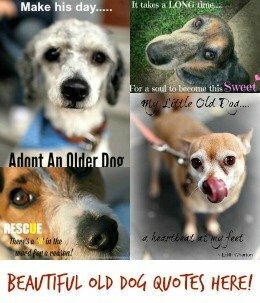 I stumbled upon this site almost by accident, and I must say I am overwhelmed by the amount of info catered to old pups! I wish I had found out about the site years ago! 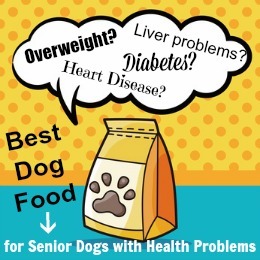 It’s hard to find information geared towards older dogs. 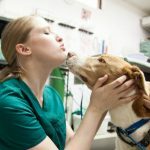 So often we rely on what’s worked for our pets when they were younger but the truth is, with old age comes a new way of thinking about and caring for your pet. I remember years ago when one of my Dachshunds, Henry, had gotten a little long in the tooth and had begun to act like it. Always a mellow dog, over the years he had become sluggish, tired all the time, and bored. At first I chalked it up to his age. At that time I was in my early 50s, so I knew the feeling of not always being eager and ready to pop up for a run or swim! However, as he grew older it grew more and more apparent that Henry’s issues weren’t mental – they were physical. Having had dogs my whole life, I thought I knew the source of Henry’s symptoms. Hesitancy to move? Check. Limping? Check. All signs pointed to canine arthritis. Having experience with canine arthritis and having seen back pain in older dogs I’ve had in the past, I thought Henry’s pain lied in his ligaments and was the result of bones rubbing against each other due to cartilage wearing away with the years. After taking Henry to my vet, we learned that yes, internal damage throughout the years had worsened Henry’s small body, but the victims were his vertebrae. Henry was diagnosed with IVDD. 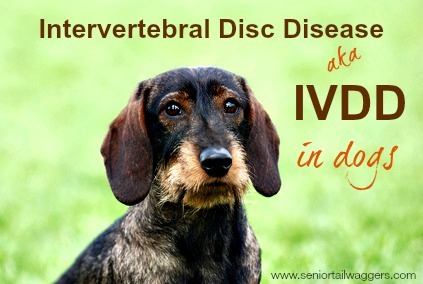 IVDD, or Intervertebral Disc Disease, is a degenerative disease that affects countless breeds at various ages. It occurs when discs in the spinal column begin to shift so much so that they protrude outward, pressing against the spinal cord and its nerves. At that time I knew a little something about IVDD because incidentally my other dog at the time, June, had been recently diagnosed with the disease herself. June was significantly younger and far more active – we knew that her IVDD and back-related issues were results of the sudden, short impacts caused by her constant running, jumping and leaping. How could it be that my two dogs, so different in activity level and age, were suffering from the same ailment? Was Henry a little daredevil behind our backs? IVDD can have a whole range of symptoms, and a variety of treatment options. Protect your dog by learning about these here… Intervertebral Disc Disease in Dogs. We learned that there are in fact two types of IVDD. This type occurs when a dog spine experiences a sudden impact that causes the disc to shift out of place. Type two – the type Henry was diagnosed with — is more gradual but the results are the same: pressure on the spinal cord and its nerves caused by a bulging disc. Type II IVDD affects older dogs between the ages of eight and 15 by its very nature, and isn’t targeted to primarily chrondrodystrophic breeds. Type II can present very similar to other ailments like arthritis and certain cancers. Be sure to consult your vet should you see any of the symptoms Henry experienced — while they could just be signs of old age, they could also be signs of something more serious. Henry and June were four years apart, Henry being the oldest. They both were born of the same father. Henry’s body was shorter and stockier—like a little tootsie roll. June was more like a pencil. Henry seemed to know his limits in terms of movement as the years went by. As a youngster he would jump into the passenger seat floor of our small, low car and up onto the seat with ease and effortlessness. One day he stopped doing that. When the car door open he sat and waited. I knew something was up. The same with our living room couch. It was fairly low and an easy jump on and off. He stopped doing that too. I started picking him up more and could feel his back tense up and he whimpered. I brought him to the vet and he confirmed that Henry had IVDD. He was given the standard protocol of confinement and rest, steroids, anti-inflammatories, pain killers, muscle relaxers. With Henry it was slower and more gradual than June. Henry had the good sense NOT to do certain things anymore. He stopped jumping up on anything and was more cautious and careful than June. I don’t recall an ACUTE episode with Henry …more just a KNOWING at my end that there was wear and tear and strain happening. As a massage therapist I was always massaging both of them when they were on my lap and I massaged certain spots along the spine and could feel a heightened reaction. At times there was panting and shaking—a sure sign of pain and vet call. June’s IVDD was much more acute (arched back panic in the eyes, head cocked a certain way, and slow motion movements). Henry and June travelled quite a bit with us on road trips and on airplanes. I ALWAYS had medication on hand for both of them JUST IN CASE because we never knew if there would be a certain movement that wreaked havoc. Once they started wearing their braces a part of each day, life got better for all of us. I felt peace of mind knowing they were protected. AUTHOR BIO: Lisa Luckenbach has developed WiggleLess back braces for dogs that are overweight and need extra support, elderly with aching backs, diagnosed with IVDD-related back problems, or overly active and can benefit from the structure a dog back brace provides. In addition to running WiggleLess, Lisa is a registered yoga instructor, licensed massage therapist, public speaker, ordained minister, and breast cancer survivor. She shares her home with her husband, two teen-aged daughters, seven chickens, and three spunky, adopted dogs, Ryder (Cocker Spaniel), LaVerne (Schnauzer/Doxie mix), and Chai (Doxie/Jack russell mix). Visit wiggleless.com to learn more about Lisa and her back brace for dogs.